Spend $299.99 in Pre-Order Peanuts Large Pack FREE SHIPPING 150-250, Get 1 Baby Koi Peanut Food 2 lb. Kit Free Shipping! free. Yes... Really... really good Sanke Gold! For a lot of us, our hobby started with a few "feeder goldifsh" that we bought for 10 cents at the pet store. These little fish tought us how to care for them, and how much enjoyment these little fish can bring. As things progress and our love of fish keeping continues, we look for fish that are out of the normal realm of fish you would find at a pet store. These fish have very special colors and patterns that just cannot be found in pet shops. Our passion started as a hobby and has developed into a business that incorporates many many people who work feverishly to produce the strains of goldfish only available at Blackwater Creek koi Farms Inc.
GoldenFish@ have been developed from strains of elongated body type goldfish because this trait is much healthier. Goldenfish@ can be expected to live long healthy lives with fairly simple care. They do not have swim bladder problems and do no require any extra special food types or styles. For these reasons GoldenFish@ may be kept in outdoor ponds OR in large aquariums indoors. 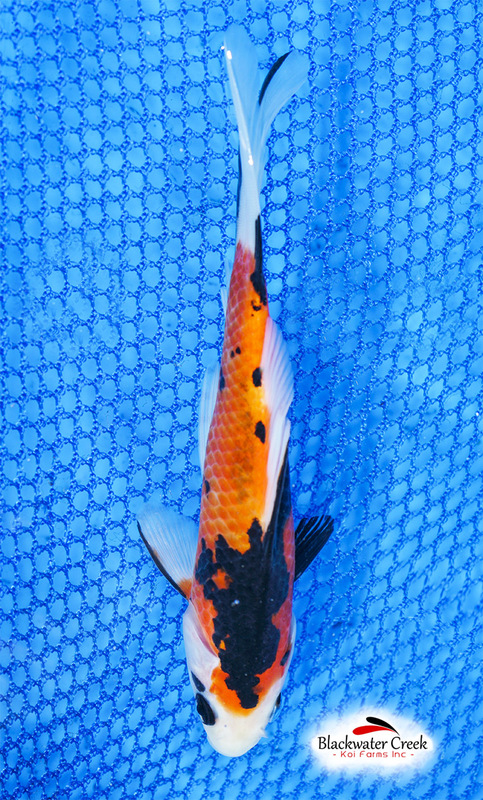 GoldenFish@ possess the colors of high end koi but typically grow to a maximum size of 12" or less. All Fish sold are born and raised at Blackwater Creek Koi Farms Inc by expert staff with over a century of experience. Blackwater Creek is a biosecure producer of quality koi and goldfish with over a decade of testing and research to back it up. Choose to buy your fish from Blackwater or one of its many retailers. Excellent variety, excellent health!!! Blackwater Creek!